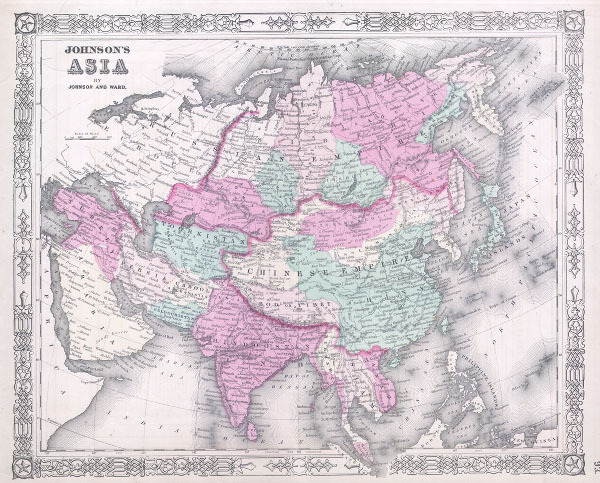 This is Johnson and Ward's 1864 map of Asia. Covers the entire continent offering good inland detail even in Central Asia and northern China. Includes parts of Europe, the Arabian Peninsula and Africa. Features the Celtic style border common to Johnson's atlas work from 1863 to 1869. Steel plate engraving prepared by A. J. Johnson for publication as plate no. 93 in the 1864 edition of his New Illustrated Atlas… This is the last edition of the Johnson's Atlas to bear the Johnson and Ward imprint. Johnson's New Illustrated Family Atlas, (1864 Johnson and Ward edition). Very good condition. Minor repair of closed tear. Blank on verso.